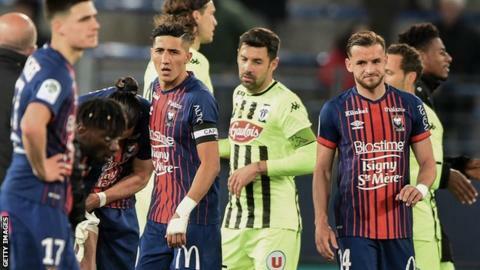 The French league is investigating "doubts about the integrity" of Caen's Ligue 1 home defeat by Angers. It follows a complaint by Caen's relegation rivals Guingamp, whose president called the league before Saturday's game to voice his concerns. The league (LFP) said it risked being "exposed to criminal sanctions" if it did not investigate the allegations. Caen dismissed Guingamp's claims as "backstage games", while Angers said they were "unacceptable". The French league said in a statement that an investigation had been opened and that "the LFP has applied the procedure according to which those involved are warned of doubts about the integrity of the game". Going into the weekend, Caen and Guingamp were level on points at the bottom of the table, two points from escaping the automatic relegation zone and moving into a play-off spot. However, Guingamp president Bertrand Desplat had been told by an unnamed member of his squad that there were doubts about Caen's match. "My player told me things that seemed strange," Desplat told French newspaper L'Equipe. "I have not denounced anyone. I have not accused anyone. I will answer the questions of the commission because I saw that an investigator had been named." Caen lost the ensuing match, and are now a point adrift at the bottom of the table after Guingamp drew 3-3 at Strasbourg. In a statement, Caen said they "deplored these backstage games" which the club "would happily do without as we focus on fighting to stay in Ligue 1". The statement added: "The LFP inquiry has to determine who gained when Guingamp made their accusations ahead of the Caen-Angers game." In a statement of their own, Angers said the accusations were "unacceptable" and "call into question the integrity of the club and bring discredit to the whole of French football".